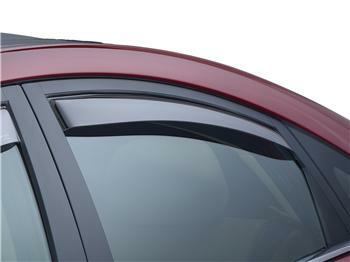 WeatherTech Side Window Deflectors offer fresh air enjoyment with an original equipment look. They are crafted from the finest 3mm cast acrylic material available. Installation is quick and easy, with no exterior tape needed. WeatherTech Side Window Deflectors do not stick to the outside of your vehicle. They install inside the window channel. These low profile window deflectors help to reduce wind noise and allow interior heat to escape, even when it is raining. WeatherTech Side Window Deflectors Dark offer you all the same qualities as the regular Side Window Deflectors with a darker tint that is similar to that of quality sunglasses. Available for select applications. WeatherTech Side Window Deflectors are designed, engineered and manufactured for quality performance and a perfect fit. Hand crafted from the finest 3mm cast acrylic. WeatherTech Side Window Deflectors are guaranteed against faulty materials and workmanship for a period of three years from the date of purchase. Exclusions to this warranty are wear due to severe abrasive conditions and chemical contamination, such as spilled gasoline, bleach, etc.